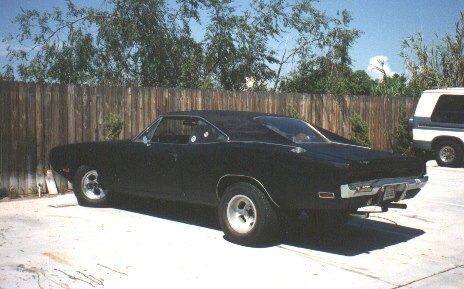 In this view you can easily see the reproduction rear valance in place. 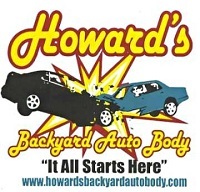 The replaced deck lid was an improvement as well. I've started doing a little body work around the trunk key area and it's going fairly well. This picture shows the new fender and front valance I installed, as well as the much-better-fitting 235/60SR15 front tires. 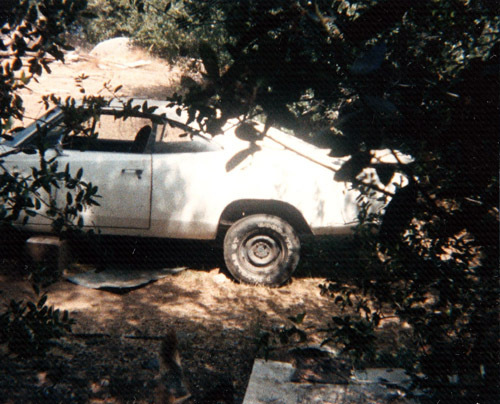 After I got out of the Navy in September 1991, I moved back to Mariposa, CA. Once I was back in the mountains, where some of the roads are rather curvy, I realized the the poor handling I was experiencing (including doing two unintentional 180's) was in part due to my tire/suspension arrangement. 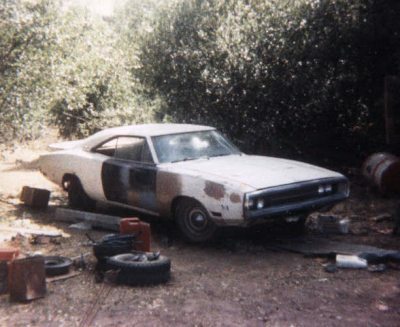 I began testing with a "sleeper" set of stock MoPar 15" rims and radials. The handling improvement was worth the trade-off in aesthetics (for a while anyway). 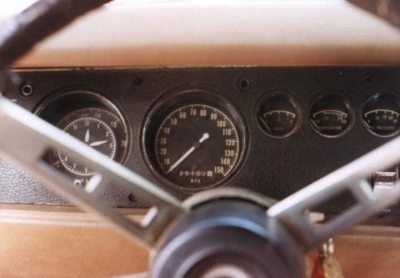 Well, the increasingly ragged white vinyl top had begun to blow off during my ocasional blasts well beyond 100mph. 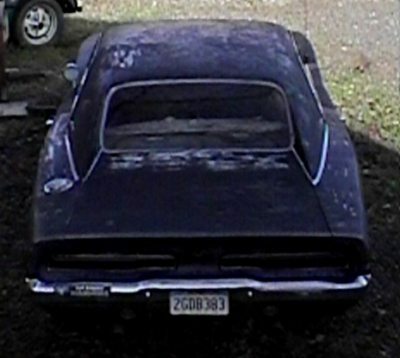 A Navy buddy (pictured here) and I removed the remnant and primed and painted the roof flat black to match the rest of the car. 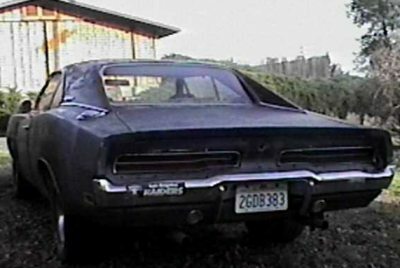 I have loved the '68-'70 Chargers' body lines for a long time, and the tail-light arrangement of the '69-'70 Chargers is one of my favorite aspects of that design. 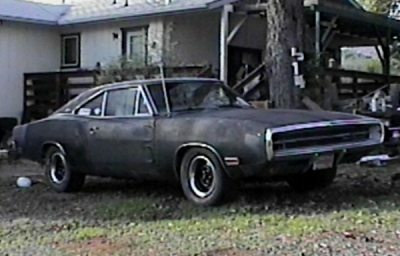 I got a pair of huge N-50x15 tires on 15"x10" slotted dish mags from a friend who took them off of his '68 Coronet, and with the help of air shocks, put them on the back of my Charger for a mean "drag-car" look. 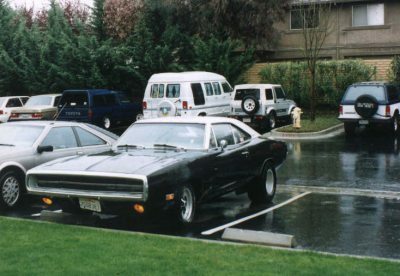 I used to like looking at my car when it would rain, because then (and only then) my paint was actually shiny. 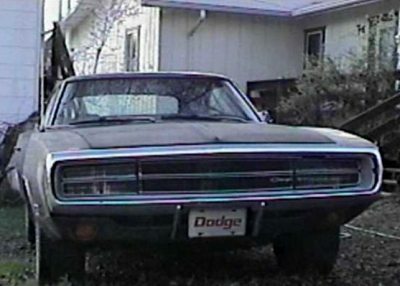 In the fall of 1987, I pulled a 1974 vintage 440 out of a Chrysler wagon I'd bought for $225, and put it in my Charger. The new engine had a stock Thermoquad, I added Hedman headers with Walker turbo mufflers and dual exhaust, Lakewood traction bars, and an Accel ignition system. 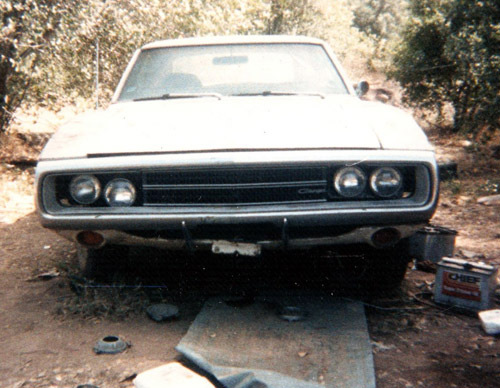 I also converted my car to use the factory electronic ignition that was in the wagon. 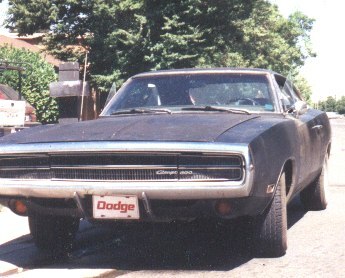 With all these changes my Charger would really fly! 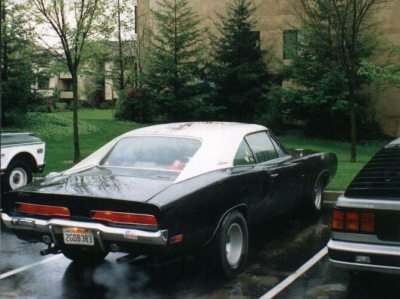 It became the most well-known and revered car in my circle of friends, in fact, to this day the first thing most of my high school era buddies ask is "how's the Charger? ", or " do you still have that Charger?" 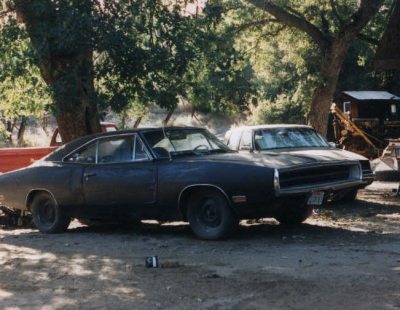 A friend and I had painted the car's body flat black, and I put a Keystone Classic 15x7 wheels on it. 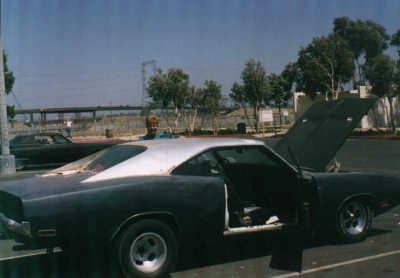 When I joined the Navy in Mar 1988, the car was parked; this photo was taken when I was home on leave in August of 1989. 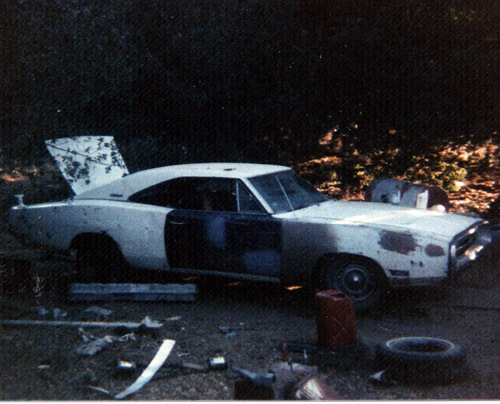 Here is an early photo of my 440. 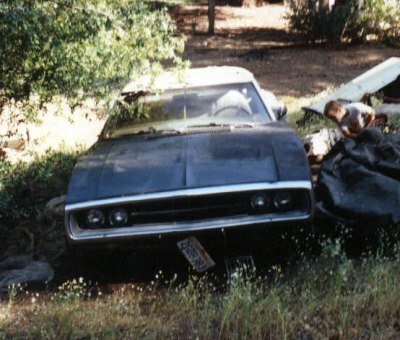 The tail lights and front parking lights were pretty much the only unsmashed lenses on the entire car when I got it. 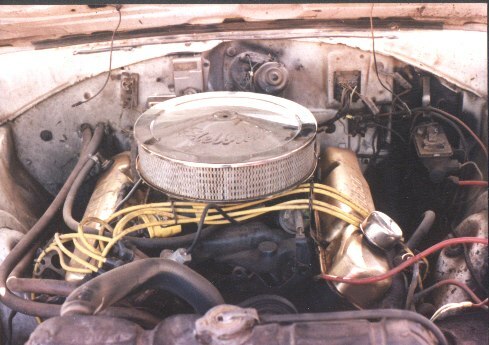 Here is the '65 383 2bbl taken from my first car (a '65 Polara 4dr). 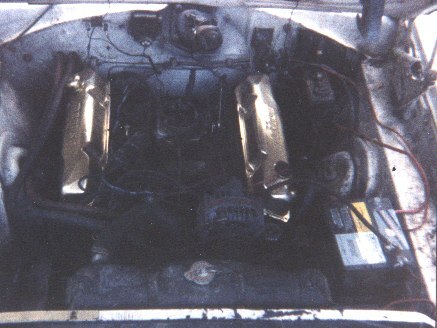 The gold anodized Moroso valve covers were not bolted on yet, but had to be in the picture. They were in the trunk of the car when I got it and I was so proud to have such a "high-performance" look. 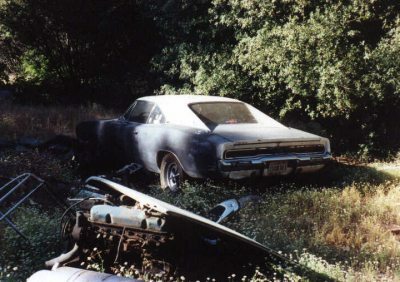 My fellow MoPar enthusiasts will no doubt see that the alternator was in the wrong place. This was resolved once I got the correct brackets. 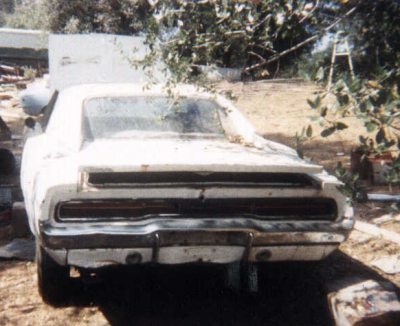 This is the earliest picture I have of my Charger. 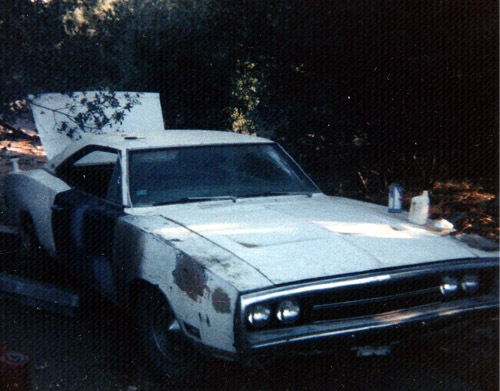 A friend and I had just finished working on the passenger door and fender in auto shop in my senior year in high school, and I put them back on the car for this photo. 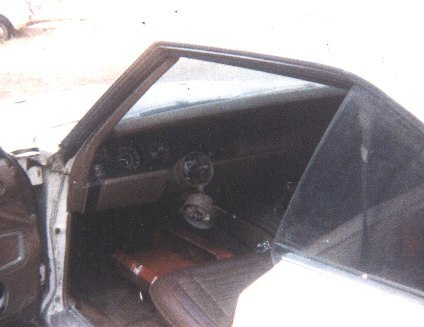 Much work remained before I would drive the car.